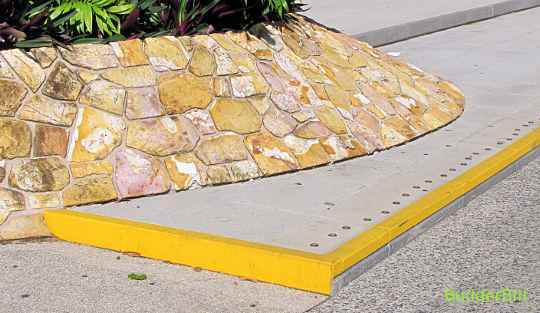 Making the edge of treads or the riser or nosing joint area of a contrasting colour and or texture so that it is easily seen. The top and face edges of treads should be made visible from the front when entering a stair and from the top when descending a stair. The two steps above could hardly be missed from the step edge point of view. They use shape, texture and colour to differentiate between the two floor levels. 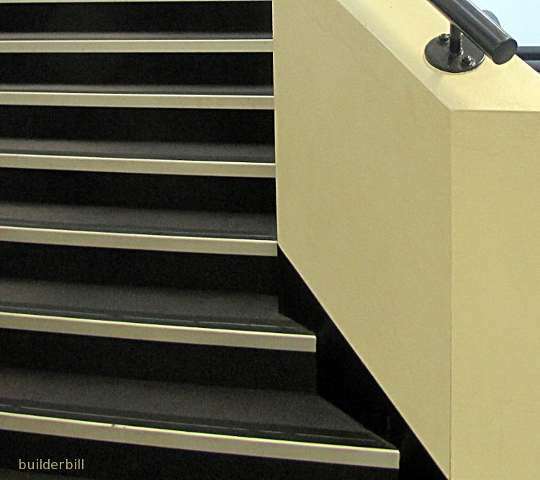 Used as an aid for visually impaired people in public and semi public spaces the contrast step edges are critically important in single steps especially like this one that has a low rise. Note the tactile buttons used also. Commercial non skid nosing strips to a carpeted internal stair. I have a photograph looking down a concrete stair in bright conditions. It wouldn't be much good here because it is almost uniformly grey and it shows nothing. On that stair at that time without looking to the side of the stair it was almost impossible to see the nosings. 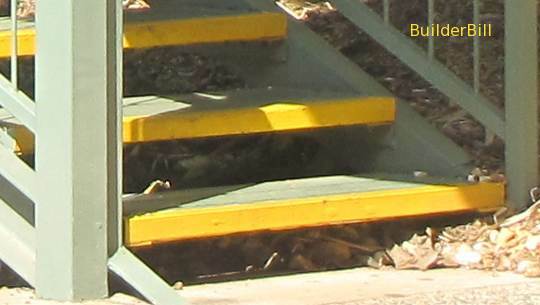 The stair above uses yellow painted edges to the top and face.This is just about the minimum that can be done as the paint will surely need fairly regular maintenance.